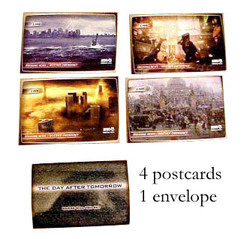 A mint set of 4 postcards to promote the hit action flick THE DAY AFTER TOMORROW starring Dennis Quaid, Sela Ward, Jake Gyllenhaal and Ian Holm. Includes a nice envelope with the 4 cards depicting different weather disasters around the world. Measures approx. 5x7 inches each.